Thank you to everyone who entered the competition to win the deluxe pampering day, sponsored by Kia Motors UK. There were 29 entries altogether - and amazingly enough all had the correct answer to this question: How many European car manufacturers offer a 7 year warranty? Of course the answer was just one - Kia Motors. I kept a list of the entries as they were emailed to me in sequential order and then numbered each one. 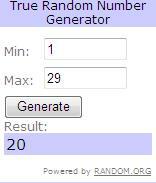 And the winner is number 20, Nova Gowers! Congratulations to you Nova. Please email me with your full details in order for the prize voucher to be sent to you. A special thanks also to Claire from Being A Mummy for helping me to load the random number image onto this post!